The question: If I'm going to silicone bond reinforcements and then hem a tarp, both made of 1.1 oz silpoly, do I leave a seam allowance or do I bond the reinforcement pieces flush with the tarp edge before I hem? I have a tube of the thin windshield sealing silicone for the bond, which I'm testing tonight. Also, any tips for the hem? I have a hem foot that makes about a 2 mm rolled hem. Some background and more questions: So, I've jumped into the deep end for a first tarp and hammock. I bought some 1.6 Hyper D and silpoly from Ripstop by the Roll. I sewed up the edges of the 1.6 to make a hammock, leaving small gaps at 2 and 4 feet from one end on both sides. This is to allow passing through some 3/16" shock cord to try out the knotty mod. I triple stitched channels in the ends, so I think it's ready to go. The seams look pretty bad, not straight and somewhat overlapping. I should have practiced, it's been years since I've sewn anything. I may rip them out and resew it. 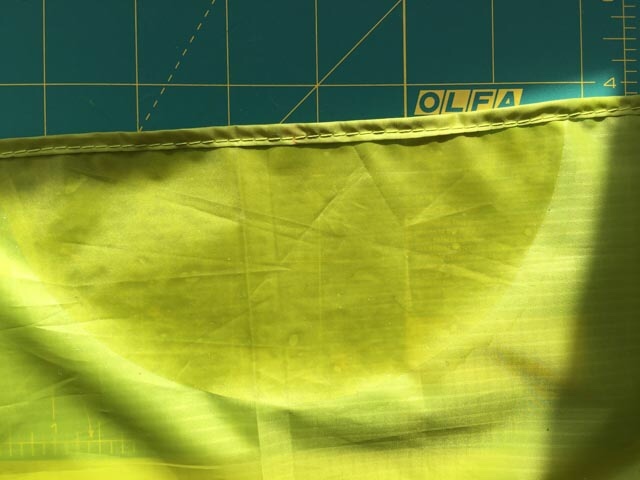 If so, should I cut the edges back a bit and start fresh to avoid weakening the fabric caused by the "extra" needle holes? I did practice some before starting on the tarp, and it shows. The flat felled seam looks pretty good, other than the stitch length varying a bit. I used Jellyfish's trick (thanks for all the awesome videos, they were a huge help) of putting some tissue under the material, which helped a LOT. I've done both of these projects.. I've done three tarps in 1.1 silpoly and one in 0.9 membrane all with bonded reinforcements, and hammocks in 1.6 Hyper D (and another in 1.2 Robic). On the tarp... 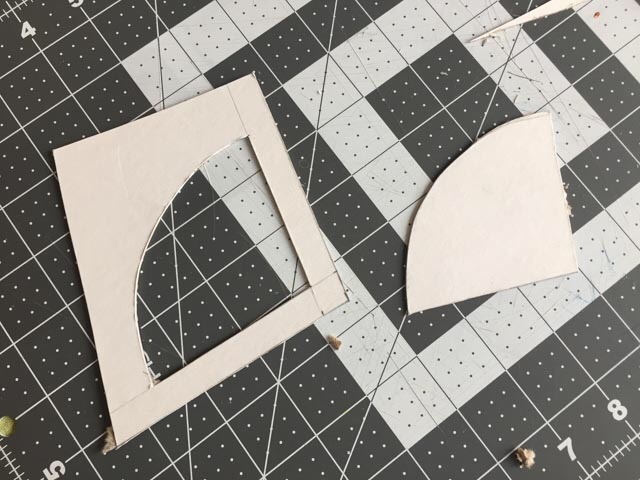 I made templates to position the reinforcements with the proper seam allowance and rolled a 1/4" hem capturing the bonding patch. The pole pocket reinforcement patch..
Used that same technique on all of them. Lots more pictures in my HF albums.. plenty of pics of the hammock build too.. Thanks MikekiM, that answers most of it! I'd buy the tarp you have for sale if I weren't this far in, looks like just about what I'm making. What adhesive did you use, what for pressure, and how long did it take to cure between coated layers? Stick with you project... it's a great learning experience. I used SilNet, diluted with Mineral Spirits about 3:1.. to the consistency of olive oil. I used a glue brush to apply it. Be careful with what you use to mix the SilNet/Mineral Spirits as the Spirits will eat through most thin plastic.. like red Solo cups. Ask me why I know this? I sandwiched each bonded patch between sheets of wax paper, put a piece of cardboard over the sandwich and placed a weight plate on it. I have a gym in my garage so plenty of weight plates. I left each piece overnight. Once the small amount of squeeze out was cured I gave it a very light dusting with powder so it wasn't tacky. I did both tarp panels at the same time spread out on the gym floor. That includes two ridge points, two ground points and the pole pocket reinforcement on each pane. 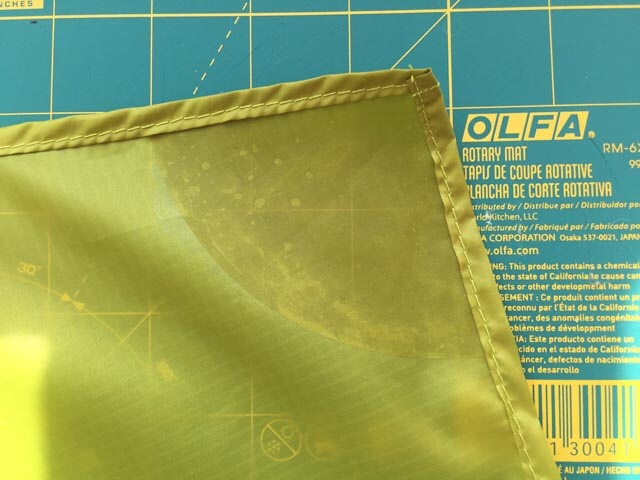 The template helped with where to apply the SilNet as well as the accounting for the seam allowance. Each template is about 3/8" larger than it's corresponding reinforcement patch. I used the template to apply the Silnet and then to position the patch properly relative to the tarps edge. Thanks for the detail. I did a test with the thin windshield silicone yesterday, sandwiched between parchment paper. Seems plenty strong in shear. The template is a good idea. I learned a similar lesson to yours about styrofoam cups and gasoline as a kid! Tarp panel tie-out reinforcements : sew or glue?